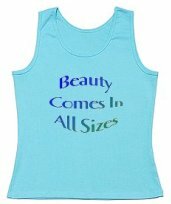 Here are some books related to size & size acceptance, and links to half.com (for more comments and/or to buy the book). I'm getting this book and will have a review for it soon. I just got this book. I can't stop myself from skimming around, but I do intend to read the whole thing soon. It has excellent material, from the humorous to the horrible (such as a reference to how calorie limitations in diets relate to calorie limitations in prisoner camps). Shows how you can get beyond trying to change your size to becoming "flabulous." The Obesity Myth is packed with health information and how studies get distorted and seldom take into account the detrimental effects of dieting. Write a review and send it to us!